For Holiday season 2017, please contact Asa’s Angel’s direct! Asa’s Angels | Christmas for Kids Each year, Asa Cox Homes helps those in need in the Northeast Ohio community during the holiday season. For 2015, Moving Ahead Services is excited and thankful to be able to help Asa help families! The process is unique, and 100% of the proceeds go to those in need – something we are all proud to be a part of. What is Asa’s Angels? Asa Cox started Asa’s Angels primarily to help families in need during the holidays. From food and gifts, clothing and more – Asa and her volunteers work tirelessly to make the holidays an exciting time for all! Their selection process for finding and choosing families is unique, it is not soley based on financial income and Asa truly digs in to find families that really need her help. How Can You Help? 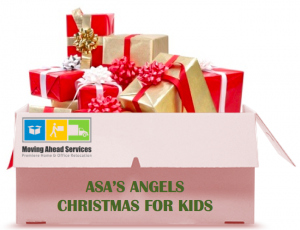 This holiday, Moving Ahead Services is helping Asa’s Angels by providing boxes, transportation and storage leading up to Asa’s distribution of gifts and holiday treats. In addition, our team members and families are also sponsoring Asa’s Angels and shopping for their holiday wish lists. To get involved, you can simply donate monetarily, or choose a family to shop for this holiday season. The kids provide a wish list, and Asa does her best to keep items evenly distributed within family units. Select a family size that makes sense for your budget, each and every single gift makes a difference! Learn more about Asa’s Angels today, visit Asacoxhomes.com.